During our first year writing for The Football History Boys we decided to create a number of different 'series' in which we would discuss various aspects of the beautiful game. These included: 'The Crest Dissected'; 'Footballers At War'; and 'Football by Decade'. The latter of which provides the inspiration for today's piece. One decade in particular appealed to me more than any other - the 1950s. Of course, when discussing the pivotal moments of the twentieth-century, they are often attributed to the 'Roaring Twenties' or the 'Swinging Sixties'. However, in terms of football - the 50s provided perhaps the most important period of ten years throughout the history of the sport. What do you think about when someone says to you - "the 1950s"? 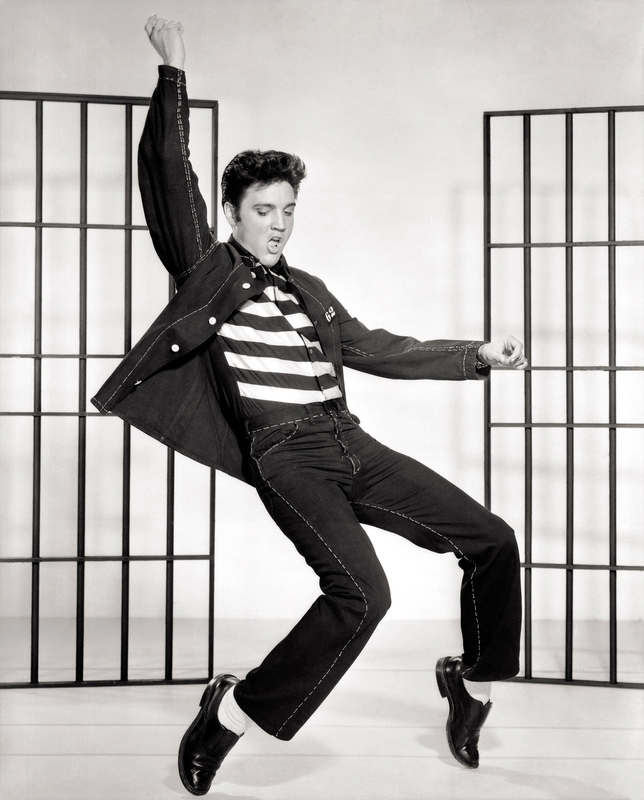 Elvis Presley...Rock and Roll...Cold War...Civil Rights...Television. Following the Second World War (1939-45), the global situation was at times on a knife-edge with US-Soviet relations at times bringing Orwellian visions from fantasy to possibility. On the other hand, technological advancements and the globalisation of industry would begin to bring the world closer in a sense, with arts and culture being utterly transformed. The list could go on and on (as with any decade), but what is important not to forget in a time of such change, was sport. Sport played a key role in the decade with football at the forefront of it. Even more popular than footballers! The state of British life was rapidly evolving also. Following years of economic regrowth and inevitable post-war austerity the standard of living generally improved. The formation of the NHS provided free healthcare and consumerism began to provide working households with more ways to spend their new income. This in time led to an increase in spectatorship at football grounds and more money within the game. For the better? We'll let you decide...! Indeed, the decade was the one in which British football opened itself up to the 'world game'. It was to be a decade of difference in terms of class and identity in the nation - was Britain the superpower it once was? Or was it needed to find a new role in the ever-changing political and economic spectrum? "The vast post-war crowds supported England with a cheerful, modest patriotism in keeping with the sense of solidarity, austerity and respectable socialism of Attlee's Britain. yet relief and jubilation at the successful conclusion of the war soon turned ti apprehension...especially among the educated governing elite. Britain was, relatively speaking, on the sidelines...losing an empire and searching for a role. British morale, especially its elite element, badly needed a lift." It was not until after the Second World War that British football began to wake up and realise that it was not so imperious as the illusion it had created for itself. For Richard Holt, the 1950s was the decade in which such chauvinistic condescension from the English began to look foolish. 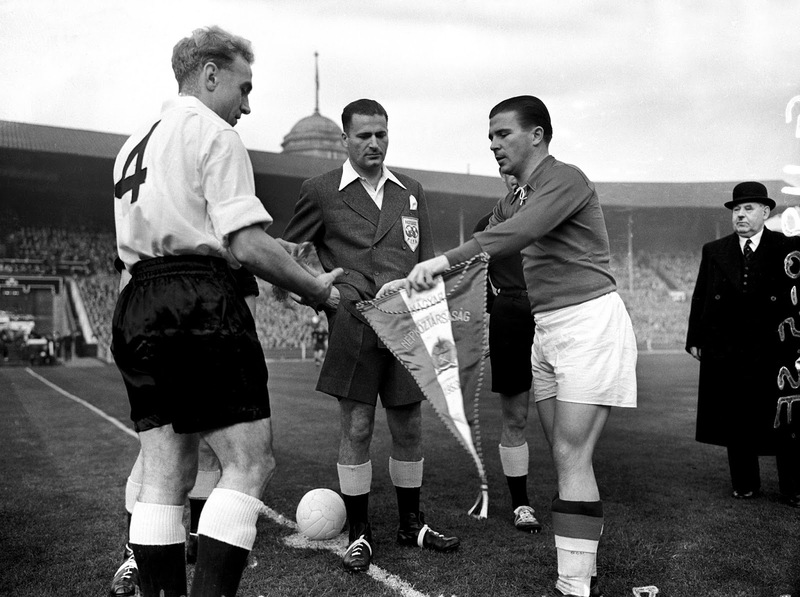 The year 1953 may not mean much at first, but in terms of football's history, it is pivotal. Alongside the coronation of Elizabeth II, 'Atoms of Peace', and the conquering of Everest by Edmund Hillary and Tenzig Norgay - football was about to change forever. Perhaps unsurprisingly, two of the decades most pivotal moments come from Wembley Stadium. The first of which holds a certain sense of nostalgia to British sport - The Matthews Cup Final. The introduction of television had made the match the first major sporting event (at least the second half) in which millions could watch and enjoy from the comfort of their homes. The FA Cup, by the 1950s had already been established as an icon of nationality and in 1953 was a symbol of social unity and harmony in the aftermath of World War II (Taylor, 2008). Fortunately for the crowd, the match was an all-time classic with Blackpool beating Bolton 4-3 thanks to a Stan Mortensen hat-trick and a man-of-the-match performance from the 'Wizard of the Dribble' - Stanley Matthews. Within days universal calls for Matthews to be knighted were found all through the English media. The Times - Click here for more on the game - "2014 World Cup: What England Can Learn From the 1950s". But there was no need to worry - the next day the British press were in fact celebrating a victory over the Hungarians....in Table Tennis! "England's revenge on Hungary England gained some revenge for yesterday's football defeat when they beat Hungary 5-4 in the first full-scale mixed international table tennis match between the two countries at the Empire Pool, Wembley, last night. After losing four of the first five matches, England took the last four in a row." The 1950s, for all its promise of progression was not free from the clutches of tragedy. 1958. In February of that year, the Manchester United football team was travelling home from a European Cup tie with Partizan Belgrade. Following a brief stop to refuel in Munich, heavy snow created a slushy surface on the airport's runway. Despite two previous take-off failures, one more was attempted, leading to the aircraft, which was carrying the 'Busby Babes' and a number of journalists, to plough through a fence into a nearby field. The result was fatal - eight first team players (including star full-back Duncan Edwards); 3 of the staff; 8 journalists and 4 others were killed - shocking the entire nation. "WATCHED BY A LARGE CROWD: THE BODY OF ROGER BYRNE, MANCHESTER UNITED CAPTAIN, WHO DIED IN THE MUNICH AIR DISASTER, BEING CARRIED INTO ST. MICHAEL’S, FLIXTON. 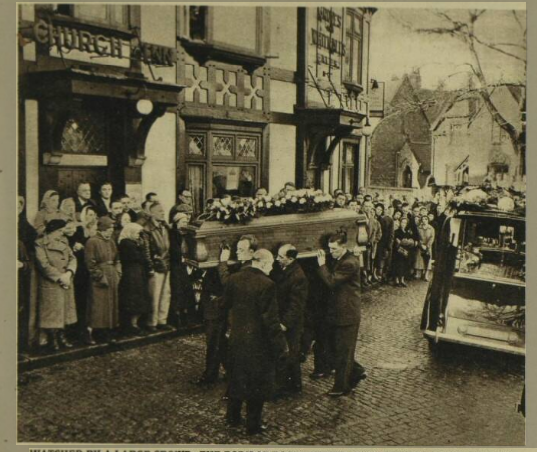 Huge crowds lined the streets of Manchester on February 10 as the hearses carrying the bodies of the victims of the Munich air crash drove from the airport to the Manchester United ground at Old Trafford. There were also many mourners at the various funeral M services, including that for Roger Byrne, the Manchester United captain, on Feb. 12"
The end of the decade was indeed one of the most progressive in terms of footballer's wages. In a turn of events which was sure to divide opinions, the eradication of the maximum wage for football players changed the way we see football forever. The PFA had grown in influence during the first half of the twentieth-century, fighting for the rights of its members. Injuries or a termination of contract could be catastrophic for a footballer in the 1950s, with early retirement leading to limited opportunities. In turn, this would lead to a number of the country's finest players beginning to ply their trade abroad - Welsh legend John Charles an example of this with his move to Italian side Juventus. Indeed, by 1959, the gap between workers wages and footballers was getting smaller, with no profit being made by an increase in television coverage and general commercialisation of the game. So what would happen? That's a story for the 1960s! Serie A Superstar - John Charles. So there we have it, the 1950s - a decade of immense change and revolution on and off the football pitch. The wider change in culture, class and identity was to be mirrored within the beautiful game. British football was shown to be backwards and not as mighty as it thought. If the nation was the 'sick man of Europe' following the Second World War, the state of its national sport surely proves this. However, events like the defeat to the Hungarian Golden Team in 1953 or the growth of the PFA brought with it a wake-up call and a realisation that Britain was not quite as imperious as it once was. The decade wasn't totally revolutionary, moreover it laid the foundations for such change to be developed in the coming decades - the 1960s would highlight this - with Beatlemania, civil rights and of course, the 1966 World Cup.